Transform your event guests to another dimension. 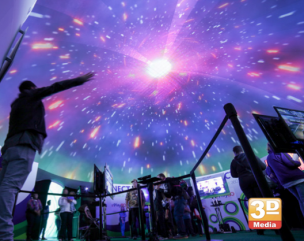 Geodome Laser Light Show provides an extraordinary sensory guest experience. When guests enter the geodome, the conference white noise disappears, they recline on relaxing lounge chairs, house lights go to dark, and music greets their ears, the laser light show is about to begin. Transported to another place, your event guests will remember this sensory bouquet of amazement. Sponsor signage, a scripted DJ and audio recordings are laced with brand advertisings that will be remembered. Silent Audio Experience Event guests are given headsets to deliver a synchronized musical experience and advertising channel. This Promotion Includes Geodome, advertising banners, laser light show, DJ, silent audio headsets, synchronized music & 3D light diffuser glasses.